Demand is heating up! 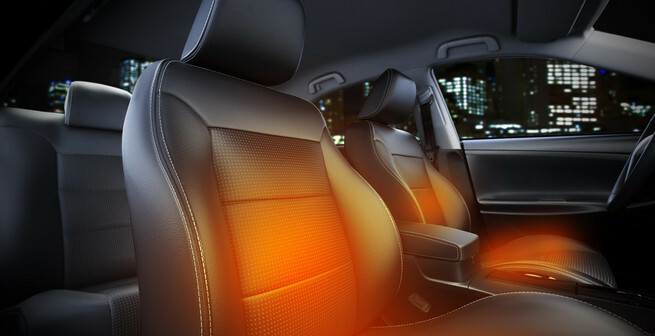 Experience the gentle, therapeutic warmth of a heated seat system that works with cloth or leather vehicle seats. Make yourself more comfortable on those cold winter mornings. Add heated seats to your current or new vehicle. The installation is seamless and only takes one day to complete. The Seat Heater elements are very thin and install between the seat cover material and the seat cushion on your existing seat. They are fully water-resistant (not waterproof) and pose NO problem with damp winter cloths, spilled beverages, or wet pets! They are NOT visible and do not detract from the finish or look of your vehicle's factory upholstery. All wiring and the heat element controller are concealed below the seat or run under the door sill trim plate, carpeting, etc. It is fully compatible with existing power seats or multi-adjustable "sport" type seats finished in cloth, vinyl, or leather. A small three-position switch (off, low, high) is installed in the lower seat trim panel for a "factory" type appearance. Every heated seat system is backed by a 3 year/36,000 mile warranty.